Sir Robert William Robson CBE (18 February 1933 – 31 July 2009) was an English footballer and football manager. His career included periods playing for and later managing the England national team and being a UEFA Cup-winning manager at Ipswich Town F.C. Robson's professional playing career as an inside forward spanned nearly 20 years, during which he played for three clubs: Fulham, West Bromwich Albion, and, briefly, Vancouver Royals. He also made 20 appearances for England, scoring four goals. After his playing career, he found success as both a club and international manager, winning league championships in both the Netherlands and Portugal, earning trophies in England and Spain, and taking England to the semi-finals of the 1990 FIFA World Cup, which remained the national team's best run in a World Cup since 1966 until they reached the semi-finals of the 2018 World Cup. His last management role was as a mentor to the manager of the Republic of Ireland national team. Robson was created a Knight Bachelor in 2002, was inducted as a member of the English Football Hall of Fame in 2003, and was the honorary president of Ipswich Town F.C. From 1991 onwards, he suffered recurrent medical problems with cancer, and in March 2008, put his name and efforts into the Sir Bobby Robson Foundation, a cancer research charity which has so far collected over £12 million (March 2018). In August 2008, his lung cancer was confirmed to be terminal; he said, "My condition is described as static and has not altered since my last bout of chemotherapy... I am going to die sooner rather than later. But then everyone has to go sometime and I have enjoyed every minute." He died just under a year later. Robson was born in Sacriston, County Durham, the fourth of five sons of Philip and Lilian Robson (née Watt). When he was a few months old, Robson's family moved to the nearby village of Langley Park where his father was a coal miner. Their two-bedroom house had no bath and an outside toilet. As a boy, he was often taken by his father to watch Newcastle United play at St James' Park on Saturday afternoons, requiring a 34-mile round trip. Robson described Jackie Milburn and Len Shackleton as his childhood heroes. Both played for Newcastle in the inside-forward position, the position Robson would later assume during his playing career. Robson attended Langley Park primary school and then Waterhouses secondary modern school, but the headmaster did not allow the school football team to join a league. Instead, he began to play for Langley Park Juniors on Saturday mornings at age 11, and by the time he was 15, he was representing the club at under-18 level. Robson played football whenever he possibly could but left school aged 15 to start work as an electrician's apprentice for the National Coal Board in the Langley Park colliery. In May 1950, Bill Dodgin, the manager of Fulham, made a personal visit to the Robson household to offer Bobby a professional contract. Despite being offered a contract by nearby Middlesbrough, the offer made by Dodgin was too attractive to turn down, so he signed for Fulham and moved to London, playing as a wing half and inside forward. Robson had also interested his beloved Newcastle, but he opted to join Fulham as, in his opinion, "Newcastle made no appreciable effort to secure [my] signature." He also thought he stood a better chance of breaking into the first team at Fulham. Robson suffered from partial deafness in one ear, which rendered him ineligible to be called up for national service. Although Robson had signed professionally, his father insisted he continue to work as an electrician. He spent the day working at the Festival of Britain site and trained three nights a week at Fulham. Eventually, this took its toll on Robson and he gave up his trade for full-time professional football. In 1950, Robson made his first-team debut for Fulham, recently promoted to the First Division, in a match against Sheffield Wednesday. He came to regard Fulham as "a nice club, a social club...", but "never... a serious, championship-challenging club". Indeed, he and Fulham were relegated from the top-flight in the 1951–52 season, but he made his return to the First Division, four years later, when he signed for Vic Buckingham's West Bromwich Albion in March 1956. The transfer fee of £25,000 was a club record for West Brom at the time. He made his West Brom debut in a 4–0 home defeat to Manchester City on 10 March 1956. In 1957–58, he was the club's top league goalscorer; his tally of 24 goals included four in a 5–1 win against Burnley. Often playing as a midfielder, he went on to play 257 matches and score 61 goals for West Brom, and he captained the team for the 1960–61 and 1961–62 seasons. However, in August 1962, he returned to Fulham after a disagreement with West Brom vice-chairman Jim Gaunt over his salary. The ongoing dispute over both minimum and maximum wages in the game, instigated by Robson's teammate Jimmy Hill and the Professional Footballers' Association, combined with the birth of Robson's second son, prompted Robson to demand a higher salary. Gaunt refused to negotiate Robson's contract, so Robson placed a transfer request and was sold to Fulham for £20,000 in a deal which doubled his salary. Soon after Robson joined Fulham, the club sold Alan Mullery and Rodney Marsh, meaning Robson's chances of securing any significant honour there were substantially reduced. Robson himself stated, "In all my time as a footballer, I didn't win a thing." Despite press reports of interest from Arsenal, and the offer of a player-manager role by Southend United, Robson left Fulham in 1967 and accepted a three-year deal with Canada's Vancouver Royals. He was to be player-manager in their inaugural 1968 season in the North American Soccer League (NASL) and believed it "was a chance too good to miss". He began scouting and holding tryout camps for the new team in the Fall of 1967. The position proved difficult; a long-distance joint-ownership agreement gave the Hungarian footballer Ferenc Puskás control over the San Francisco section of the squad, while Robson took care of the Vancouver squad. Robson was dissatisfied by this situation and when, in January 1968, Fulham offered him a contract as their manager, he accepted the position at Craven Cottage. During his first spell at Fulham, Robson participated in two ambassadorial Football Association tours in the West Indies in 1955 and South Africa in 1956. However, it was during his time at West Bromwich Albion that he graduated to the full England squad, with his first call-up in 1956. His manager, Vic Buckingham, advocated the "push and run" approach to the game, a precursor to "total football", and playing this, Robson graduated to the full England squad in 1956, It was also at West Brom when Robson met future England international and assistant coach Don Howe. Robson went on to make 20 appearances for the England national team, making his debut in a November 1957 victory against France, scoring twice in a 4–0 victory. Although he made a successful debut, he was dropped for England's next match, against Scotland, in favour of Bobby Charlton. However, Robson was selected for the 1958 FIFA World Cup squad, ahead of Nat Lofthouse and Stanley Matthews, but returned from host nation Sweden disappointed after England were defeated by the Soviet Union in a group play-off match. Following the World Cup, Robson became an established member of the England squad, enjoying considerable success in a period between October 1960 and March 1961 when he played in six England victories, including scoring a goal in the record 9–3 defeat of Scotland at Wembley Stadium. He was selected for the 1962 World Cup finals in Chile, but an injury to his ankle sustained in a pre-tournament friendly against a Chilean club side ruled him out of most of the tournament. As Robson recalled, "I never played for England again... my international career was unfulfilled." His place in the England team was taken by Bobby Moore. In 1959, the then England manager and the Football Association (FA) director of coaching, Walter Winterbottom, suggested to Robson that he take a coaching course at Lilleshall. He obtained coaching qualifications during his second spell at Fulham, and coached Oxford University A.F.C.. Robson made his debut as a manager in January 1968 at his former club Fulham, against Macclesfield Town, then in the Cheshire County League, in the third round of the FA Cup. Fulham were struggling with 16 points from 24 matches. Despite the acquisition of the young Malcolm Macdonald, Robson could not save the club from relegation to the Second Division, and he left them in November with the club sitting eighth in the Second Division. He discovered he had been sacked not from the club itself, but from the headline "Robson sacked" on an Evening Standard placard outside Putney station. He moved on to Ipswich Town in 1969 and it was there that he established his reputation as a successful manager, supported by the club chairman John Cobbold and then later by his brother Patrick Cobbold. He won the vacant job at the Suffolk club after a chance encounter with Town director Murray Sangster while scouting at Portman Road for Chelsea manager Dave Sexton. After four mediocre seasons, Robson led Ipswich to fourth place in the First Division and success in the Texaco Cup in the 1972–73 season. In the following nine seasons, Ipswich finished lower than sixth place in the First Division only once, in the 1977–78 season. However, that season was a success with a 1–0 victory over Arsenal in the FA Cup final. His reign at Ipswich lasted 13 years, during which time the club twice finished as League runners-up, and made regular appearances in European competitions, capturing the UEFA Cup in 1981 with a 5–4 aggregate victory over Dutch side AZ 67 Alkmaar. About that team, Robson said: "We played with two strikers, no wingers, Eric Gates sitting off the front two, two semi-wide midfield players in Arnold Muhren and Frans Thijssen and Johnny Wark sitting in the holding role". During his 13-year tenure, he brought in only 14 players from other clubs, most notably Allan Hunter, Bryan Hamilton and Paul Mariner, relying instead on players developed through Ipswich's youth programmes, including Terry Butcher, George Burley, John Wark, Mick Mills, Colin Viljoen, Alan Brazil, Trevor Whymark, Brian Talbot, Kevin Beattie and Eric Gates, who all went on to play international football. His imports included Dutch players Frans Thijssen and Arnold Mühren. Robson was not a tactical genius but he showed a talent for developing new players, with his good interpersonal skills, caring attitude, hard work and enthusiasm helping them to achieve their best. In 2002, in recognition of his achievements with the club, a life-size statue of Robson was unveiled opposite the Cobbold Stand of Ipswich Town's ground, Portman Road. On 7 July 2006, Robson was named as honorary president of Ipswich Town Football Club, the first since Lady Blanche Cobbold who had died in 1987. Robson's achievements with Ipswich earned him a job offer from the Football Association for the position of national coach, and he declined an offer of a ten-year contract extension and increased salary from Ipswich director Patrick Cobbold. On 7 July 1982, two days after England were knocked out of the 1982 World Cup, he succeeded Ron Greenwood as coach of the England national team, selecting former West Bromwich Albion teammate Don Howe as his chief coach. Robson's first match in charge saw immediate controversy, as he dropped Kevin Keegan for the match against Denmark. On 21 September 1983, Robson suffered his only loss in the 28 qualifying matches he was to undertake as England manager. The defeat, again to Denmark, ultimately led to England's failure to qualify for the 1984 European Championships and resulted in Robson offering to resign in favour of Brian Clough. The resignation was rejected by FA chairman Bert Millichip (primarily down to his and the FA's disdain for Clough), and Robson went on to lead the England team to qualify for the 1986 World Cup in Mexico. It wasn't the hand of God. It was the hand of a rascal. God had nothing to do with it... That day, Maradona was diminished in my eyes forever. Robson's England dropped only one point in qualifying for Euro 1988, which included an 8–0 victory over Turkey. However, this was followed by failure at the tournament itself, held in West Germany, where England were eliminated in the group stage. They finished bottom of their group, succumbing to defeats against the Republic of Ireland, the eventual winners, the Netherlands, and the eventual runners-up, the Soviet Union. Robson was vilified by the British press, and after a draw in a friendly with Saudi Arabia, one newspaper demanded, "In the name of Allah, go." Again Robson submitted his resignation, and again it was rejected by Millichip (again Brian Clough is often cited as a reason). This was followed by victories over Belgium and Cameroon in the knock-out stages, to set up a semi-final with West Germany. England lost the match on a penalty shoot-out, after the score had been tied at 1–1 following extra time. Robson said afterwards, "[N]ot a day goes by when [he] does not think about the semi-final and other choices [he] might have made." Robson was the second coach, after Alf Ramsey, to take England to a World Cup semi-final, and the first coach to do so on foreign soil, an achievement not equalled until Gareth Southgate's team reached the semi-finals of the 2018 World Cup. Before the 1990 World Cup, the FA told Robson it would not renew his contract as England manager, so he moved on to the Netherlands to coach PSV Eindhoven, succeeding manager Guus Hiddink, who had left the team after leading them to the 1987–88 European Cup victory and four consecutive Eredivisie titles. PSV sought a manager capable of instilling discipline into a fractious squad, much as Hiddink had done previously. Robson described the move as "a culture shock" but felt "a sense of adventure". News of Robson's new position in the Netherlands became public before the start of the 1990 World Cup, leading to tabloid stories impugning Robson's patriotism; he sued Today for calling him a traitor. The Dutch penchant for tactical debate surprised Robson. In an interview with Voetbal International, he lamented, "An English pro accepts the manager's decision. After every match here, the substitutes come and visit me." Another of his challenges at PSV was handling the Brazilian international Romário. Robson became frustrated with the Brazilian's work ethic, although admitted "in some matches he would be scintillating". Robson arranged showdown talks with Romário, with Frank Arnesen, Robson's assistant, acting as a translator. The talks proved unsuccessful, with Romário unwilling to change his lifestyle. Despite this, PSV won the Eredivisie in both the 1990–91 and 1991–92 seasons. However, the team did not make the progress expected by the board in European competitions and Robson was informed he would be leaving the club at the end of the 1991–92 season. Robson moved to Sporting CP in July 1992, where his Portuguese interpreter was a young José Mourinho, future Porto, Chelsea, Internazionale, Real Madrid and Manchester United manager. Robson guided the club to a third-place finish in his first season in charge while admitting the club was in "a terrible state". He described the club's president as a "loose cannon" who frequently signed players without Robson's consent. Robson was sacked in December 1993 with the club sitting at the top of the league table. Club president Sousa Cintra cited the club's early exit from the UEFA Cup, at the hands of Casino Salzburg, as the reason for his dismissal. Sporting CP's rivals Porto quickly hired Robson, with Mourinho appointed as his assistant manager. Living in the same apartment block at the time was another future Porto, Chelsea and Tottenham Hotspur manager, the young André Villas-Boas, who, aged 16, introduced himself to Robson. Robson subsequently appointed Villas-Boas to work in the Porto observation department and helped him gain his UEFA "C" coaching badge in Scotland, despite him technically being ineligible as he was aged 17. Porto were in a poor state when Robson arrived and the average attendance had dwindled to 10,000. The club promptly went on to beat Robson's former club, Sporting CP, in the Taça de Portugal final, following that achievement with successive League titles in the 1994–95 and 1995–96 seasons. Such was the impact of Robson at Porto, he became known to the locals as "Bobby Five-O" in honour of the number of matches Porto won 5–0, and he signed a new contract with the club in 1995. Suffering from malignant melanoma and missing the first few months of the 1995–96 season, Robson still successfully led Porto in defence of their league title. A phone call during the summer of 1996 from Barcelona vice-president Joan Gaspart to discuss Luís Figo resulted in an offer of employment with the Spanish club. Robson took over in July 1996, where again his assistant was Mourinho; Robson had made Mourinho's move with him to the Camp Nou a condition of his employment. One of the key decisions Robson made during his brief tenure at Barcelona was the US$19.5 million signing of Ronaldo, who was influential in a season when Barcelona won the Copa del Rey, Supercopa de España and European Cup Winners' Cup. Robson himself was voted European Manager of the Year for 1996–97, while Ronaldo stated, "as a trainer without doubt [Robson] is one of the greatest in the world". The 1997–98 season saw Robson moved "upstairs" to the general manager position, with Louis van Gaal taking over as manager, but Robson stayed in this position for only one season before returning to manage PSV on a short-term deal for the 1998–99 season. PSV missed out on the league title, finishing third behind Feyenoord and Willem II, but Robson still led the club to victory in the Johan Cruyff Shield and also qualification for the UEFA Champions League on the last day of the season. After Robson's contract expired, he returned to England to take up a position in the Football Association's technical department, but following the resignation of Ruud Gullit at Newcastle United, Robson moved to St James' Park in September 1999. Robson was disappointed with the club's opening salary offer, stating, "[I]t was miles below the going rate," but negotiated a one-year, £1 million deal. In Robson's first home match in charge, bottom-placed Newcastle faced second bottom Sheffield Wednesday, thrashing them 8–0. In his first season in charge, 1999–2000, Robson led the club to an 11th-place finish, with 14 wins from his 32 matches in charge. In late 2000, following the resignation of ex-Magpies boss Kevin Keegan as England manager, the FA asked Newcastle club chairman Freddy Shepherd to permit Robson to take over in a part-time caretaker capacity, but the request was refused. Robson guided Newcastle from bottom of the Premier League to a fourth-place finish in the 2001–02 season. The following season, Newcastle finished third, ensuring qualification for the UEFA Champions League for the second consecutive year. However, Robson was unable to guide Newcastle through the Champions League qualifying rounds, and the club was dropped to participate in the UEFA Cup for the 2003–04 season. At the end of the 2003–04 season, Newcastle finished fifth in the table, five points short of the Champions League qualifying fourth place but reached the semi-finals of the UEFA Cup before losing to Marseille. Robson held the Newcastle post until 30 August 2004, when he was dismissed by Freddy Shepherd, after a poor start to the Premier League season and alleged discontent in the dressing room. Robson's dismissal followed publication of his off the record observation of his disappointment that only 5,000 fans stayed to see the traditional lap of honour made by the players at St James' Park at the end of the previous season. However, he remains held in the highest esteem by the fans; he was granted the Freedom of the City of Newcastle upon Tyne on 2 March 2005. What is a club in any case? Not the buildings or the directors or the people who are paid to represent it. It's not the television contracts, get-out clauses, marketing departments or executive boxes. It's the noise, the passion, the feeling of belonging, the pride in your city. It's a small boy clambering up stadium steps for the very first time, gripping his father's hand, gawping at that hallowed stretch of turf beneath him and, without being able to do a thing about it, falling in love. Robson's autobiography, entitled Bobby Robson: Farewell but not Goodbye was released in 2005. The title is based on one of his quotes upon leaving the England job in 1990: "I'm here to say goodbye—maybe not goodbye but farewell." In the book, Robson was critical of Shepherd, claiming that while manager he was denied information regarding the players' contracts and transfer negotiations. He also criticised Shepherd and the club's deputy chairman Douglas Hall, for their focus on the first team and St James' Park, causing them to neglect less glamorous issues, such as the training ground, youth development and talent scouts. The club's training ground was later blamed by Graeme Souness, Robson's successor, for a series of injuries to first team players. On 7 June 2005, Robson declined the invitation to become director of football of Heart of Midlothian because he wanted to stay in the Newcastle area. On 13 January 2006, Steve Staunton was appointed manager of the Republic of Ireland national team, with Robson named in a support role as "international football consultant". Robson stepped down from his role of consultant on 17 November 2007 following the nation's final match in their unsuccessful qualifying campaign for Euro 2008. Robson was a former vice president of the League Managers Association, a non-executive role. Robson met Elsie Gray on a trip back to his parents' home in Langley Park. Gray was a student nurse, and later a teacher. They were married on 25 June 1955 with Fulham teammate Tom Wilson as Robson's best man. After 1991, Robson was repeatedly diagnosed as suffering from cancer. He had several operations and in 2006 was operated on for a brain tumour. This, on occasion, affected his work; while at Porto, for example, Robson suffered from malignant melanoma, which resulted in his missing the first few months of the 1995–96 season. On 17 October 2006, it was revealed that Robson had been given the all-clear and was set to see out his contract as consultant to the Irish team. Robson revealed on 7 May 2007 he had been diagnosed with cancer for the fifth time. On 17 May 2008, Robson was the guest of honour at the 2008 FA Cup Final at Wembley Stadium when Portsmouth defeated Cardiff City 1–0. He presented the trophy to the victorious captain, Sol Campbell. Robson made a number of product endorsements, including an appearance in Carlsberg's "Best Pub Side" television commercial. He also acted as a pundit for ITV during the 2002 World Cup and Euro 2004. Robson defeated bowel cancer in 1992, a malignant melanoma in 1995, and a tumour in his right lung and a brain tumour, both in 2006. Treatment of these conditions had left him partially paralysed due to a stroke caused by the brain tumour, and also with a partially prosthetic upper jaw after the melanoma was surgically removed. His fifth diagnosis of cancer in 2007, consisting of cancerous nodules in both lungs, was diagnosed as terminal in February 2007, and as of December 2008, was being controlled through bouts of chemotherapy. After these experiences, and following his fifth diagnosis with cancer, Robson devoted the remaining years of his life to helping fight the disease. On 25 March 2008, he launched the Sir Bobby Robson Foundation. The Foundation raised over £1 million, which funded equipment for the Sir Bobby Robson Cancer Trials Research Centre, in the Freeman Hospital in Newcastle upon Tyne, and would go on to fund other cancer projects in the North East of England. In aid of the Foundation, Robson's 1990 World Cup semi-final 4–3 loss after penalties against West Germany was replayed on 26 July 2009 as the Sir Bobby Robson Trophy match at St James' Park, featuring players from the original 1990 World Cup squads and other special guests. Robson was given a guard of honour before the match, which finished 3–2 to the England side. At the time of Robson's death, the Foundation had raised £1.6 million. Donations totalling £156,000 were received by the Foundation in the 18 days following his death, and on 15 October 2009, it was announced the Foundation had raised over £2 million, and that at the request of Robson's family, Alan Shearer would take over Robson's role as the Foundation's patron. It passed the £2.5 million mark in September 2010. Three other patrons were added in 2010, Steve Gibson, Mick Mills and Niall Quinn. On 31 July 2009, Robson died of lung cancer at his home in County Durham, aged 76, after a long battle with the disease. After the news of his death, leading figures from the world of football and politics paid tribute to him. Manchester United manager Sir Alex Ferguson called him a "great friend, a wonderful individual and tremendous football man". UEFA president Michel Platini said, "He will be remembered not only for his playing career and his outstanding managerial career at both club and international level, but also because he was a truly warm and passionate human being." Gary Lineker said, "It is a sad day and a great loss. He was a wonderful man and will be deeply missed by everybody in the country. I never played for a more enthusiastic man. He gave so much to the game." Former Prime Minister of the United Kingdom Tony Blair described Robson as a "real Geordie gentleman". According to the then-Prime Minister Gordon Brown, Robson "epitomised everything that is great about football in this country". His friend, the broadcaster Michael Parkinson, said, "Robson will be remembered long after the present lot are old bones. By his decency, his humour, his love of the game's traditions and origins and confusion at what it had become, he made present day football look what it is – shabby by comparison. I can think of no more fitting epitaph." Robson's funeral, a private family ceremony, took place on 5 August 2009. The location remained undisclosed at the request of his family until the funeral had taken place. It was later revealed to be Esh, County Durham. A thanksgiving service for Robson was held on 21 September 2009 at Durham Cathedral. One thousand invited guests attended the service, which was also broadcast live on national television, and to Newcastle United's St James' Park, Ipswich Town's Portman Road ground and Fulham's Craven Cottage. Robson was survived by his wife and their three sons: Andrew, Paul and Mark. Robson was awarded a number of honours for his contributions to football. In 1990, at the end of his eight-year reign as England manager, he was appointed a CBE in 1991 and in 2002, he was knighted; both awards were for services to football. In 2002 (during his time as Newcastle manager), the 69-year-old Robson was awarded the freedom of Newcastle upon Tyne and the UEFA President's Award for "services to football". He was inducted into the English Football Hall of Fame in 2003 in recognition of his impact as a manager. Following his time as Newcastle United manager in 2005, Robson was made an Honorary Freeman of Newcastle, which, in his autobiography, he described as being "the proudest moment of my life". Robson also won the 1992 Football Writers' Association Tribute Award for an outstanding contribution to the national game, and the 2001 British Sports Writers' Association Pat Besford Trophy for Outstanding Achievement. In 2005, he received a lifetime achievement award from the Sports Coach UK Awards, and was also awarded the Eircom International Personality of the Year in 2006. On 9 December 2007, Robson was awarded the Lifetime Achievement Award at the BBC's Sports Personality of the Year show in recognition of "his contribution as both player and manager in a career spanning more than half a century". On 5 May 2008, during the 30th anniversary celebrations of Ipswich Town's 1978 FA Cup win, Robson was granted the Freedom of Ipswich by the Lady Mayor. On 8 December 2008, he earned another such accolade when he was given the Freedom of the City of Durham. In March 2009, UEFA awarded Robson the Emerald UEFA Order of Merit award, awarded to "individuals who have dedicated their talents to the good of the game". The award was presented to Robson at St James' Park on 26 July 2009, prior to the Sir Bobby Robson Trophy match, and just five days before his death. In December 2009, Robson was posthumously awarded the FIFA Fair Play Award, for the "gentlemanly qualities he showed throughout his career as a player and coach". All English football league matches held a one minute's applause in his memory at the beginning of the 2009–10 season. The Football League gave Newcastle United and Ipswich Town special dispensation to wear special commemorative kits for their Championship match on 26 September 2009 at Portman Road, in aid of Sir Bobby's Foundation. At half-time during this match, the North Stand of Portman Road was renamed the Sir Bobby Robson Stand. The first anniversary of Robson's death on 31 July 2010 was marked with a ceremony and pre-season friendly match at Newcastle's St James' Park, between two of his former clubs Newcastle United and PSV Eindhoven, involving Robson's PSV captain Stan Valckx presenting a PSV shirt to the club. In July 2010, plans were unveiled for a memorial garden to Robson to be built in Newcastle. It was to be created by the city council in partnership with the regeneration company NE1Ltd, and located on Gallowgate street close to the Newcastle United stadium St James' Park. Work began on the site in November 2010, which was completed by Spring 2011. The garden covers 400 square meters, and features a tiered seating area and sculpted stone plinths reflecting aspects of his life and work. The area also hosts 400 square metre memorial garden to Sir Bobby Robson. With a keen interest in cricket as well as football, Robson was to have replaced Mike Gatting as president of the Lord's Taverners charity and cricket club in 2007, but this was prevented by his ill-health. After his death, the club held a dinner in his honour, as "The best President we never had". In March 2011, the East Coast train operating company named one of its Class 91 electric locomotives Sir Bobby Robson, unveiled at Newcastle station by his widow Elsie and Alan Shearer. Similarly, in December 2011, the Port of Tyne Authority named its new work boat the Sir Bobby Robson. On 6 May 2012, a statue of Robson created by sculptor Tom Maley was unveiled at St James' Park before a 2–0 defeat to eventual champions Manchester City. On 16 July 2013, marking the 150th anniversary celebrations of the FA, the FA designated 10 August as the Sir Bobby Robson National Football Day, celebrated as a day to celebrate the national game. In 2018, Bobby Robson: More Than A Manager, a feature-length British film about Robson's career and cancer diagnosis, was released to critical acclaim. Robson, Bobby (1982). Time on the Grass. Arthur Barker. ISBN 0-213-16845-6. Robson, Bobby (1990). Bobby Robson: An Autobiography. Hutchinson. ISBN 0-09-174499-7. Robson, Bobby; Harris, Bob (1998). Bobby Robson: An Englishman Abroad. Macmillan. ISBN 0-330-36985-7. Robson, Bobby; Hayward, Paul (2005). Farewell but not Goodbye. Hodder & Stoughton. ISBN 0-340-82346-1. Robson, Bobby (2008). Newcastle – My Kind of Toon. Hodder & Stoughton. ISBN 978-0-340-97783-5. Kuper, Simon (1996). Football Against the Enemy (chapter 11). Orion. ISBN 0-7538-0523-5. King, Jeff (1997). High Noon: A Year at Barcelona. Virgin Books. ISBN 1-85227-633-9. Harris, Bob (2004). Sir Bobby Robson: Living the Game. Weidenfeld & Nicolson. ISBN 1-84188-244-5. ^ a b "Football legend Robson dies at 76". BBC Sport. 31 July 2009. Retrieved 31 July 2009. ^ Stott, Matt. "Ipswich: Sir Bobby Robson Foundation reaches £7m milestone as Mick Mills and Alan Shearer join Lady Elsie Robson in thanking fundraisers". East Anglian Daily Times. Ipswich. Retrieved 2 July 2014. ^ Taylor, Louise (30 July 2009). "Sir Bobby Robson dies at the age of 76". The Guardian. London. Retrieved 17 November 2013. ^ Robson, Bobby (2005). "Going underground". Farewell but Not Goodbye. Hodder & Stoughton. p. 6. ISBN 0-340-82346-1. ^ a b "Robson: Dream to manage Newcastle". BBC Sport. 30 September 1999. Retrieved 13 June 2007. ^ Robson. Farewell but Not Goodbye. p. 15. ISBN 0-340-84064-1. ^ "Three Tuns reunite with tons of happy memories". The Northern Echo. Darlington. 23 September 2008. Archived from the original on 30 September 2012. Retrieved 2 April 2009. ^ Robson. Farewell but Not Goodbye. p. 8. ISBN 0-340-84064-1. ^ Robson. Farewell but Not Goodbye. p. 1. ISBN 0-340-84064-1. ^ a b c d e f g h "Sir Bobby Robson". ESPN. Archived from the original on 2 October 2012. Retrieved 15 May 2007. ^ Robson. Farewell but Not Goodbye. pp. 18–19. ISBN 0-340-84064-1. ^ a b "Newcastle United F.C. History – Bobby Robson". Newcastle United F.C. Archived from the original on 19 February 2013. Retrieved 4 February 2013. ^ a b "Sir Bobby : Ten Facts". BBC Tyne. Archived from the original on 13 April 2005. Retrieved 17 November 2013. ^ "Sir Bobby Robson". The Daily Telegraph. 31 July 2009. Retrieved 8 September 2018. ^ Robson. Farewell but Not Goodbye. p. 20. ISBN 0-340-84064-1. ^ Robson. Farewell but Not Goodbye. p. 21. ISBN 0-340-84064-1. ^ a b Robson. Farewell but Not Goodbye. p. 24. ISBN 0-340-84064-1. ^ Robson. Farewell but Not Goodbye. pp. 25, p28. ISBN 0-340-84064-1. ^ "Fulham 1951-1952 : English Division One (old) Table". Statto. Archived from the original on 15 October 2014. Retrieved 17 November 2013. ^ Ponting, Ivan (1 August 2009). "Sir Bobby Robson: Esteemed football player and manager who led England to the World Cup semi-finals". The Independent. London. Retrieved 17 November 2013. ^ Robson. "Tales From The Riverbank". Farewell but Not Goodbye. p. 29. ISBN 0-340-84064-1. ^ Matthews, Tony; Mackenzie, Colin (1987). Albion! A Complete Record of West Bromwich Albion 1879–1987. Breedon Books. p. 294. ISBN 0-907969-23-2. ^ a b Matthews, Tony (2005). The Who's Who of West Bromwich Albion. Breedon Books. pp. 202–203. ISBN 1-85983-474-4. ^ Matthews, Tony (2007). West Bromwich Albion: The Complete Record. Breedon Books. pp. 172 & 292. ISBN 978-1-85983-565-4. ^ Ronnie Allen was the club's top scorer overall, with 28 goals. ^ McOwan, Gavin (2002). The Essential History of West Bromwich Albion. Headline. pp. 252–253. ISBN 0-7553-1146-9. ^ Robson. Farewell but Not Goodbye. p. 39. ISBN 0-340-84064-1. ^ Robson states Gaunt was chairman at the time, however he was vice-chairman until 1963. ^ Robson. Farewell but Not Goodbye. pp. 39–40. ISBN 0-340-84064-1. ^ Robson. Farewell but Not Goodbye. p. 40. ISBN 0-340-84064-1. ^ a b Robson. Farewell but Not Goodbye. p. 43. ISBN 0-340-84064-1. ^ Robson. Farewell but Not Goodbye. p. 44. ISBN 0-340-84064-1. ^ Robson. Farewell but Not Goodbye. p. 61. ISBN 0-340-84064-1. ^ Robson. Farewell but Not Goodbye. p. 62. ISBN 0-340-84064-1. ^ Jukich, Roy (10 October 1967). "Local Talent Surprises Boss". The Vancouver Sun. Retrieved 28 December 2018. ^ Jukich, Roy (16 January 1968). "Puskas Wins Soccer Derby". The Vancouver Sun. Retrieved 12 February 2011. ^ Robson. Farewell but Not Goodbye. pp. 64–65. ISBN 0-340-84064-1. ^ Robson. "La-di-dah". Farewell but Not Goodbye. p. 31. ISBN 0-340-84064-1. ^ Robson. Farewell but Not Goodbye. p. 33. ISBN 0-340-84064-1. ^ a b Robson. Farewell but Not Goodbye. pp. 33–35. ISBN 0-340-84064-1. ^ "Managers – Sir Bobby Robson". Newcastle United F.C. Archived from the original on 25 January 2013. Retrieved 16 May 2007. ^ Robson. Farewell but Not Goodbye. pp. 48–49. ISBN 0-340-84064-1. ^ Robson. Farewell but Not Goodbye. p. 53. ISBN 0-340-84064-1. ^ Robson. Farewell but Not Goodbye. p. 54. ISBN 0-340-84064-1. ^ Robson. Farewell but Not Goodbye. pp. 58–60. ISBN 0-340-84064-1. ^ Robson. Farewell but Not Goodbye. p. 299. ISBN 0-340-84064-1. ^ "Fulham 1967-1968 : English Division One (old) Table as at 20 January 1968". Statto. Archived from the original on 15 October 2014. Retrieved 17 November 2013. ^ Robson. Farewell but Not Goodbye. p. 66. ISBN 0-340-84064-1. ^ "Fulham 1967-1968 : English Division One (old) Table". Statto. Archived from the original on 2 December 2013. Retrieved 17 November 2013. ^ "Bobby Robson". Fulham F.C. Retrieved 17 November 2013. ^ Robson. Farewell but Not Goodbye. pp. 67–68. ISBN 0-340-84064-1. ^ Robson. "The Last Corinthians". Farewell but Not Goodbye. p. 72. ISBN 0-340-84064-1. ^ a b "Bobby Robson". Pride of Anglia. Archived from the original on 16 December 2008. Retrieved 17 November 2013. ^ "1978 – Osbourne's year". BBC Sport. 10 May 2001. Retrieved 16 May 2007. ^ "Ipswich thankful for Thijssen". UEFA. 2 January 2006. Archived from the original on 6 October 2013. Retrieved 17 November 2013. ^ "Bobby Robson: One-on-One". Four four two. 31 January 2003. Retrieved 20 March 2019. ^ "Sir Bobby Robson statue unveiled". BBC Sport. 16 July 2002. Retrieved 14 May 2007. ^ "Ipswich president role for Robson". BBC Sport. 6 July 2007. Retrieved 13 May 2007. ^ Robson. "A town awakes". Farewell but Not Goodbye. p. 102. ISBN 0-340-84064-1. ^ a b Glanville, Brian (31 July 2009). "Sir Bobby Robson". The Guardian. London. Retrieved 17 November 2013. ^ Robson. Farewell but Not Goodbye. Retrieved 4 February 2013. ^ Robson. "Slings and arrows". Farewell but Not Goodbye. p. 108. ISBN 0-340-84064-1. ^ "Bobby Robson". England Football Online. Chris Goodwin, Glen Isherwood & Peter Young. 23 June 2012. Retrieved 19 November 2017. ^ a b "England's Euro record". The Football Association. Archived from the original on 4 April 2005. Retrieved 15 June 2007. ^ Robson. Farewell but Not Goodbye. p. 110. ISBN 0-340-84064-1. ^ "The time is now". ESPN. 24 May 2006. Retrieved 17 November 2013. ^ "WORLD CUP 1986". web.ukonline.co.uk. Archived from the original on 1 May 2007. Retrieved 17 June 2007. ^ Robson. Farewell but Not Goodbye. p. 121. ISBN 0-340-84064-1. ^ a b "World Cup history – Mexico 1986". BBC Sport. 4 May 2006. Retrieved 23 May 2007. ^ Robson. "A left hook". Farewell but Not Goodbye. p. 116. ISBN 0-340-84064-1. ^ "1988 European Championship". The Football Association. Archived from the original on 6 April 2005. Retrieved 15 June 2007. ^ "English football's elder statesman". BBC Sport. 21 August 2000. Retrieved 31 August 2007. ^ Robson. Farewell but Not Goodbye. p. 112. ISBN 0-340-84064-1. ^ "Italy 1990". England Football Online. Chris Goodwin, Glen Isherwood & Peter Young. 27 May 2014. Retrieved 19 November 2017. ^ "World Cup 1990 – Match schedule". Planet World Cup. Jan Alsos. Retrieved 16 June 2007. ^ "Robbo ready for new challenge". The Football Association. 30 October 2003. Archived from the original on 6 April 2005. Retrieved 16 August 2007. ^ a b "Statistics: Italy 1990". BBC Sport. 12 April 2002. Retrieved 16 August 2007. ^ Fordyce, Tom (16 June 2004). "Sven's toughest test?". BBC Sport. Retrieved 23 August 2007. ^ Robson. "Zeroes to heroes". Farewell but Not Goodbye. p. 132. ISBN 0-340-84064-1. ^ "World Cup history – Italy 1990". BBC Sport. 27 April 2006. Retrieved 23 May 2007. ^ "Well done Sir Bobby". Yorkshire Evening Post. Leeds. 11 December 2007. Retrieved 17 November 2013. ^ Watson, Stuart (7 July 2018). "Ramsey, Robson... Southgate? A proud record Ipswich Town fans will be happy to see scrubbed". East Anglian Daily Times. Retrieved 21 March 2018. ^ Kuper, Simon (1996). Football against the enemy. London: Orion. p. 93. ISBN 0-7528-4877-1. ^ Robson. "On the road". Farewell but Not Goodbye. pp. 146–47. ISBN 0-340-84064-1. ^ Robson. Farewell but Not Goodbye. p. 148. ISBN 0-340-84064-1. ^ Robson. Farewell but Not Goodbye. pp. 148–150. ISBN 0-340-84064-1. ^ Robson. Farewell but Not Goodbye. pp. 150–53. ISBN 0-340-84064-1. ^ Robson. Farewell but Not Goodbye. pp. 153–54. ISBN 0-340-84064-1. ^ "Sir Bobby Robson". Newcastle United F.C. Archived from the original on 19 February 2013. Retrieved 4 February 2013. ^ "Novice delighting in the Dragao dugout". FIFA. 23 September 2010. Retrieved 17 November 2013. ^ "Crucial role of boy scout who is Mourinho's 'eyes and ears'". The Independent. London. 11 July 2004. Archived from the original on 16 February 2013. Retrieved 4 February 2013 – via Highbeam Research. ^ Robson. Farewell but Not Goodbye. p. 158. ISBN 0-340-84064-1. ^ "The Sir Bobby Robson Collection". Daily Mirror. London. Archived from the original on 13 October 2013. Retrieved 17 November 2013. ^ "Sporting Lisbon – Porto". FootballDerbies.com. Retrieved 19 June 2007. ^ a b Robson. Farewell but Not Goodbye. pp. 160–61. ISBN 0-340-84064-1. ^ a b McNulty, Phil (26 April 2005). "Tactical masters fight for glory". BBC Sport. Retrieved 15 June 2007. ^ Robson. Farewell but Not Goodbye. p. 168. ISBN 0-340-84064-1. ^ "Fast facts on Ronaldo". Sports Illustrated. Retrieved 31 August 2007. ^ "Managers – Bobby Robson (1996–97)". FC Barcelona. Retrieved 17 November 2013. ^ "Ronaldo praises Robson". BBC Sport. 25 February 2003. Retrieved 14 May 2007. ^ a b c d Hayward, Paul (21 September 2009). "Sir Bobby Robson's memorial service: football figures assemble in Durham". The Guardian. London. Retrieved 17 November 2013. ^ "Bobby Robson returns to PSV". BBC Sport. 6 April 1998. Retrieved 16 August 2007. ^ "Netherlands 1998/99". Rec.Sport.Soccer Statistics Foundation. Retrieved 4 February 2013. ^ Robson. Farewell but Not Goodbye. p. 185. ISBN 0-340-84064-1. ^ "Robson: Dream to manage Newcastle". BBC Sport. 30 August 1999. Retrieved 17 August 2007. ^ "Robson takes Newcastle hotseat". BBC Sport. 3 September 1999. Retrieved 15 May 2007. ^ a b Robson. "Going home". Farewell but Not Goodbye. p. 190. ISBN 0-340-84064-1. ^ "England 1999/2000". Rec.Sport.Soccer Statistics Foundation. Retrieved 26 August 2007. ^ McNally, Brian (15 October 2000). "Football: FA Warned: Hands off our Bobby". Sunday Mirror. London. Archived from the original on 28 March 2015. Retrieved 4 February 2013 – via Highbeam Research. ^ "2001–02: F.A. Premier League". Football Club History Database. Richard Rundle. Retrieved 19 November 2017. ^ "2002–03: F.A. Premier League". Football Club History Database. Richard Rundle. Retrieved 19 November 2017. ^ Walker, Michael (29 August 2003). "Newcastle pay price of failure". The Guardian. London. Retrieved 17 November 2013. ^ "Newcastle's Euro dream over". BBC Sport. 6 May 2004. Retrieved 4 February 2013. ^ Robson. Farewell but Not Goodbye. p. 257. ISBN 0-340-84064-1. ^ Winter, Henry (2 August 2009). "Sir Bobby Robson: Newcastle's saviour and inspiration to Alan Shearer". The Daily Telegraph. London. Retrieved 4 February 2013. ^ a b "Sir Bobby receives city freedom". BBC News. 2 March 2005. Retrieved 10 June 2007. ^ ""It's the noise, the passion, the feeling of belonging": What does NUFC mean to you?". Evening Chronicle. Newcastle upon Tyne. 1 November 2013. Archived from the original on 22 May 2014. Retrieved 22 May 2014. ^ "Farewell But Not Goodbye (Hardcover)". Amazon.com. Retrieved 10 June 2007. ^ "Newcastle United Football Club – Bobby Quotes (#16)". NUFC.com. Retrieved 27 May 2007. ^ Robson. "Going home". Farewell but Not Goodbye. pp. 195–197. ISBN 0-340-84064-1. ^ Stewart, Rob (20 October 2005). "Owen injury blamed on training pitch". The Daily Telegraph. London. Retrieved 17 November 2013. ^ "Robson rejects approach by Hearts". BBC Sport. 7 June 2005. Retrieved 15 May 2007. ^ "Republic appoint Staunton as boss". BBC Sport. 13 January 2006. Retrieved 14 May 2007. ^ Phillips, Mitch (15 November 2007). "Robson ready to retire from pitch at 74". Reuters. Retrieved 17 November 2013. ^ "LMA Structure". League Managers Association. Archived from the original on 27 March 2008. Retrieved 2 November 2007. ^ Robson. Farewell but Not Goodbye. pp. 151–53. ISBN 0-340-84064-1. ^ Robson. Farewell but Not Goodbye. pp. 162–68. ISBN 0-340-84064-1. ^ "Robson discharged from hospital". BBC Sport. 7 August 2006. Retrieved 13 May 2007. ^ "Robson gets the all-clear". BreakingNews.ie. Landmark Digital. 17 October 2006. Retrieved 17 November 2013. ^ "Sir Bobby Robson Cancer Trial And Research Centre Launched". Medical News Today. 26 March 2008. Retrieved 4 February 2013. ^ "FA Cup final as it happened". BBC Sport. 17 May 2008. Retrieved 21 March 2019. ^ "Probably the best pub team". The Football Association. 19 April 2006. Retrieved 20 September 2010. ^ Fordyce, Tom (14 June 2004). "Reasons to be cheerful". BBC Sport. Retrieved 29 August 2007. ^ Hall, Jane (25 March 2008). "Sir Bobby admits time is running out, but battles on for charity". The Journal. Newcastle upon Tyne. Retrieved 17 November 2013. ^ Stewart, Rob (24 April 2009). "England Italia '90 team to re-stage Germany semi in aid of Sir Bobby Robson charity". The Daily Telegraph. London. Archived from the original on 24 April 2009. Retrieved 24 April 2009. Sir Bobby Robson is hoping to settle an old score after England and Germany players who contested the heart-breaking 1990 World Cup semi-final agreed to re-stage the epic game to boost his fund-raising efforts. ^ "England v Germany rematch to honour Sir Bobby Robson". Evening Chronicle. Newcastle upon Tyne. 24 April 2009. Archived from the original on 24 April 2009. Retrieved 24 April 2009. ...the match, which will take place on July 26 at St James' Park...As well as reuniting 1990 England players, Sir Bobby is also planning on calling on some other famous guests to add to his team. He said: "I'm very grateful to my former players who are coming up to Newcastle to help us raise money for my charity. I'm also very appreciative of the efforts of the German players who have so much further to travel. ^ a b Tallentire, Mark (26 July 2009). "Sir Bobby Robson Trophy: Final Score — England 3 Germany 2". The Northern Echo. Darlington. Retrieved 20 September 2010. ^ Caulkin, George (1 August 2009). "Sir Bobby Robson's legacy lives on in charity". The Times. London. Archived from the original on 20 September 2009. Retrieved 20 September 2009. ^ "Sir Bobby Robson foundation total soars". News Guardian. Morpeth. 18 September 2009. Archived from the original on 20 September 2009. Retrieved 20 September 2009. ^ "Robson cancer fund at £2m: Shearer". Press Association. 15 October 2009. Archived from the original on 15 October 2009. Retrieved 15 October 2009. ^ "Sir Bobby Robson Foundation reaches £2.5m mark". BBC News. 16 September 2010. Retrieved 29 March 2011. ^ "Steve Gibson Becomes Teesside Patron of the Sir Bobby Robson Foundation". Sir Bobby Robson Foundation. 15 February 2010. Archived from the original on 29 March 2011. Retrieved 29 March 2011. ^ "Ipswich Legend Mick Mills Becomes Suffolk's Patron of the Sir Bobby Robson Foundation". Sir Bobby Robson Foundation. 23 April 2010. Archived from the original on 29 March 2011. Retrieved 29 March 2011. ^ "Niall Quinn Becomes A Patron of the Sir Bobby Robson Foundation". Sir Bobby Robson Foundation. 5 November 2010. Archived from the original on 29 March 2011. Retrieved 29 March 2011. ^ Stewart, Jonathan. "Football legend Sir Bobby Robson dies". 4ni. Flagship Media Group. Archived from the original on 5 June 2011. Retrieved 31 July 2009. ^ "Legend Sir Bobby Robson, 76, dies". BBC Sport. 31 July 2009. ^ a b "Football honours Sir Bobby Robson". BBC Sport. 31 July 2009. ^ Fowler, Andrew (31 July 2013). "Four years on since the death of Sir Bobby Robson". Evening Chronicle. Retrieved 1 September 2018. ^ "Sir Bobby laid to rest near where he grew up". Evening Chronicle. Newcastle upon Tyne. 6 August 2009. Archived from the original on 17 October 2014. Retrieved 17 November 2013. ^ "Sir Bobby Robson receives knighthood". BBC News. 21 November 2002. Retrieved 15 May 2007. ^ "No. 52382". The London Gazette (Supplement). 28 December 1990. p. 8. ^ "No. 56595". The London Gazette (Supplement). 15 June 2002. p. 1. ^ a b Robson. Farewell but Not Goodbye. p. 297. ISBN 0-340-84064-1. ^ a b "Sir Bobby Robson receives knighthood". BBC News. 21 November 2002. Retrieved 16 August 2007. ^ "Robson joins Hall of Fame". BBC Sport. 2 December 2003. Retrieved 4 February 2013. ^ Robson. "Hello and goodbye". Farewell but Not Goodbye. p. 294. ISBN 0-340-84064-1. ^ "England Honours – Football Writers' Association Tribute Award". England Football Online. Chris Goodwin, Glen Isherwood & Peter Young. Retrieved 19 November 2017. ^ "Fletcher honoured with top award". BBC Sport. 7 December 2005. Retrieved 31 August 2007. ^ "Robson wins BBC achievement award". BBC Sport. 8 December 2007. Retrieved 8 December 2007. ^ "Sir Bobby given freedom of town". BBC News. 6 May 2008. Retrieved 21 June 2008. ^ "Sir Bobby to become city Freeman". BBC News. 8 December 2008. Retrieved 8 December 2008. ^ Chaplin, Mark (24 March 2009). "UEFA tribute to loyal football servants". UEFA. Archived from the original on 25 October 2012. Retrieved 20 September 2010. ^ "Fair Play Award honours Robson" (Press release). FIFA. 21 December 2009. Archived from the original on 29 March 2011. Retrieved 29 March 2011. ^ "League allows Robson tribute kits". BBC Sport. 18 September 2009. Archived from the original on 20 September 2009. Retrieved 20 September 2009. ^ "Sir Bobby shirts raise thousands". BBC News. 2 November 2009. Retrieved 29 March 2011. ^ "Sir Bobby Newcastle shirt sales aid teenage cancer unit". BBC News. 13 January 2010. Retrieved 29 March 2011. ^ "Ipswich to unveil 'Sir Bobby Robson Stand' when Town take on his beloved Newcastle United". Daily Mail. London. 18 August 2009. Retrieved 20 October 2011. ^ "Sir Bobby remembered one year on since his death". BBC News. 31 July 2010. Retrieved 29 March 2011. ^ "Sir Bobby Robson's Tyneside garden tribute". BBC News. 26 July 2010. Retrieved 29 March 2011. ^ "Work starts on a memorial garden to Sir Bobby Robson". BBC News. 22 November 2010. Retrieved 29 March 2011. ^ "Tribute To 'The Best President We Never Had'". 30 March 2010. Archived from the original on 29 March 2011. Retrieved 29 March 2011. ^ "Sir Bobby Robson name given to train". BBC News. 29 March 2011. Retrieved 29 March 2011. 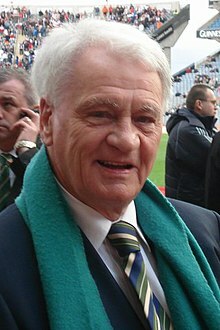 ^ "East Coast Names Train Sir Bobby Robson" (Press release). East Coast Main Line Company. 29 March 2011. Archived from the original on 29 March 2011. Retrieved 29 March 2011. ^ "New Boat and New Jobs at the Port of Tyne" (Press release). Port of Tyne. 1 March 2012. Retrieved 1 March 2012. ^ "Bobby Robson statue to be unveiled by Newcastle United at St James' Park". The Daily Telegraph. London. 26 April 2012. Retrieved 6 May 2012. ^ Pulver, Andrew (1 June 2018). "Bobby Robson: More Than a Manager review – portrait of an England icon". The Guardian. Retrieved 15 March 2019. ^ "England – International Results 1950–1959 – Details". Rec.Sport.Soccer Statistics Foundation. Archived from the original on 25 September 2012. Retrieved 11 February 2011. ^ "England – International Results 1960–1969 – Details". Rec.Sport.Soccer Statistics Foundation. Archived from the original on 28 June 2011. Retrieved 11 February 2011. ^ "England Hall of Fame". The Football Association. Archived from the original on 5 March 2005. Retrieved 14 May 2007. ^ "English Angle: Goal.com Remembers The Legendary Sir Bobby Robson (1933-2009)". Goal.com. Retrieved 9 December 2018. ^ "Pep Guardiola wanted to join Newcastle under Bobby Robson". Sky Sports. 4 May 2018. Retrieved 8 December 2018. ^ "Manager profile: Bobby Robson". Premier League. Retrieved 18 September 2018. ^ "David Beckham: Uefa to honour former England captain with President's Award". UEFA.com. Retrieved 6 December 2018. ^ "Preston's Alexander gets PFA award". The PFA. Retrieved 8 December 2018. ^ "17th eircom/FAI International Award winners announced". FAI. 4 February 2007. Archived from the original on 22 February 2012. Retrieved 8 December 2018. ^ "Robson humbled by lifetime award". BBC. 9 December 2007. Retrieved 8 December 2018. ^ "Fair Play Award honours Robson". FIFA. Retrieved 8 December 2018. ^ "FIFA Order of Merit Holders" (PDF). Retrieved 9 December 2018. 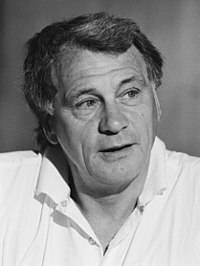 Wikimedia Commons has media related to Bobby Robson.